Aprotec manufacture a comprehensive range of Manual and Motorised stages, many of which have been made to bespoke designs. A small sample of which is shown with particular stages such as the Maglok and GSR having been developed within identified parameters. We use Cross Roller Linear Bearings in all our stages giving smooth, high load and accurate repeatability. 150mm x 100mm with manual drives and quick release mechanism. 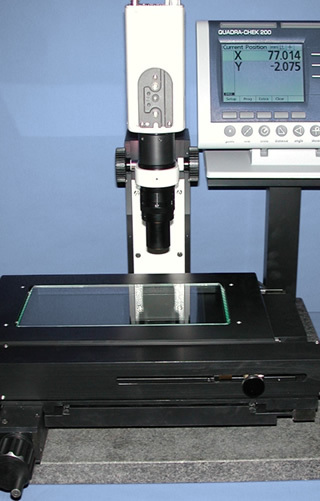 The manual range encompasses single and twin axis, as well as transmitted light versions for microscopy applications. 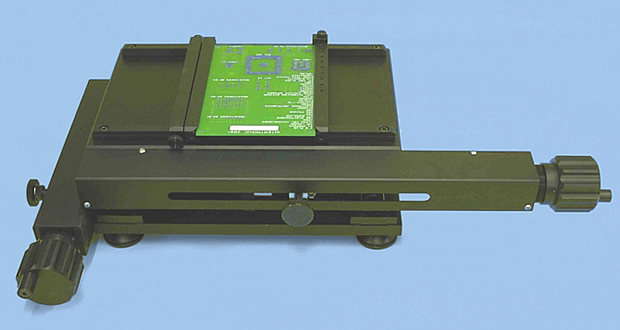 A manual stage with quick release movement but requiring high precision linear scales attached to a DRO, ‘Quadra check’ in this case, giving micron positional accuracy. In support of the motorised stages we offer a simple PC based control software with a video window for camera applications which interfaces seamlessly with our range of stages. The physical size, movement and positional accuracy can all be tailored to customer requirements, whilst all larger stages benefit from the option of manual or motorised versions.